mushrooms. Best of all, Oregon has chefs who know what to do with all this bounty. There’s no better way to celebrate all Oregon's culinary goodness than by taking a cooking vacation around the state to see where it grows and how it's prepared. If you like food, you’re invited! Fill in the form below and we'll send you an email with all our current deals for Oregon. Host your own customized private cooking class in the comfort of your central Oregon coastal home or vacation rental; our chefs bring the ingredients, recipes, and provide the instruction. You and your friends have the option to watch or play, but you always get to enjoy the finished dishes! A chef arrives at your home with the freshest ingredients in hand, ready to cook something fabulous. You and your friends pour yourself a glass of wine, and we all get our hands dirty in the kitchen together! Parties and workshops playing with chocolate just over the bridge from downtown Portland. Learn chocolate skills and techniques or have fun creating and decorating edible crafts to go. Customized projects (think chocolate wine goblets or bicycles) available. Ages 6 - 106. Small groups or private lessons by appointment. Whether you are a beginner or wish to pursue a career in the culinary arts, we can offer classes tailored to your specific needs. We offer individual classes, both demonstration and hands-on, as well as a number of topics offered as a series of classes. Our Cooking School offers innovative and educational cooking classes for the community. Cook’s, Pots & Tabletops is a member of the International Association of Culinary Professionals, Women Chefs & Restaurateurs and the Slow Food Convivium. Demonstration classes devoted exclusively to Salmon, a remarkable and nutrient-dense fish. You will learn techniques for preparation, ultimate cooking methods for bringing out the best textures and brightest flavors, and delicious recipes for preparing salmon at home. You now have the unique opportunity of having personalized classes taught in your home by a professional chef with a Master’s Degree in Holistic Nutrition. Hipcooks provides hands-on cooking classes for the novice and seasoned cook alike. Measuring implements are banned, tasting is encouraged, and your inner chef is invited to play. The best part? Every class ends with a dinner party! 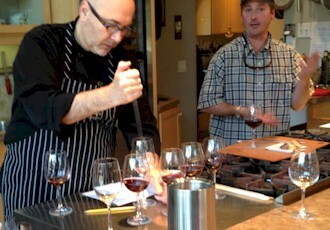 Our cooking classes are unique dining experiences where each course is carefully paired with wine. If you see a class you like, ask us about vegetarian options. Whether you are vegetarian, vegan or just love good food, we offer workshops, trainings, events and services to guide you along a healthy living lifestyle. Come make a mess in our kitchen! All classes are hands-on, and there are no skill level requirements to participate, only the will to learn and create. Join Chef Donna Smith, director of Kelly’s Cooking School, as she demonstrates the latest cooking techniques and recipes, while showing you how to get the most out of the latest kitchen appliances. Classes offered span an entire range of interests and cuisine. Call today for more information. An imaginative idea for a festive celebration--Chef John teaches you and your guests how to improve cooking and entertaining skills. All cooking classes are taught in a relaxed, fun-filled atmosphere in the comfort of your home. Parties That Cook stages hands-on cooking parties for corporate and private groups in homes and rented kitchens in the San Francisco Bay Area, Chicago, Seattle and Portland. We believe the magic of creating a meal together inspires connection. Events focus on team building, client entertainment, conferences, networking and holiday celebrations. We provide classes for the masses! No matter what your skill set is, we deliver hands on classes for the food enthusiast in a relaxed environment with a bit of sass for good measure! Or join us for a private class or team building event for your business! It is my goal here at the Seafood School to increase seafood consumption of the average consumer, by holding classes, doing demonstrations, catering seafood functions and encouraging people not to be intimidated by seafood. Sur La Table's cooking programs provide the opportunity for you to become a celebrity in your own kitchen. Instructors include each region's best-known, as well as internationally renowned chefs willing to share their secrets. The Kitchen at Honeyman Creek Farm hosts cooking classes covering a variety of topics with an emphasis on both traditional and American cuisine. The Well Traveled Fork is a creative culinary company dedicated to connecting you to the central Oregon bounty through our culinary tours, cooking classes, catering and personal chef services. Join a culinary adventurer to sip and sample your way through locally owned businesses, tasting the best of Bend! Local vendors selling locally grown produce, plants, handmade items, arts & crafts, breads, pies, soaps and more. Every Sat. Oregon”s finest & largest seafood & wine festival. NW cuisine, arts & crafts, Oregon and Washington's finest wineries, beer garden & more. Local vendors selling locally grown produce, plants, handmade items, arts & crafts, breads, pies, soaps and more. Recognized BJCP Beer, Mead, and Cider Styles. Join us on Saturday afternoon for a gigantic raffle, homebrew information, and more! "World's Largest Strawberry Shortcake" served free to over 20,000 spectators. Parade, fireworks, run/walk, and more. Our annual event showcases the versatility of saké and its ability to be paired with any food. Specializing in rare, exotic beers, over 150 world-class beers from 16 countries will be on hand, many from right here in the Pacific NW. Local vendors selling locally grown produce, plants, handmade items, arts & crafts, breads, pies, soaps and more.Every Sat. Situated on the west bank of the Willamette River, with towering Mt. Hood as a backdrop, a beautiful venue for anyone who loves craft beer. A mecca for lovers of Pinot Noir and NW cuisine. Explore, savor, and learn from luminaries of the food and wine world. This is an annual civic event to celebrate 'Elephant Garlic'. Blackberry cooking contest, car show, bike race, street dance. "A Berry Good Time for a Berry Good Cause". Celebrate the area’s abundance of fine wineries, microbrew beers, good food and local music. Southern OR's premier wine showcase, with over 60 wineries plus cocktail reception, sensory clinics, gala dinner, grand tasting & silent auction. With 13 NW breweries featuring beers aged in wine, whiskey and oak barrels, this commemorates one of Central OR’s hallmarks – craft beer.